Employers are responsible for providing a safe and healthy workplace for their employees. A Permit-Required Confined Space contains Health or Safety Hazards. Need help with your next confined space entry project? Contact us now and let us put our expertise to work for you! One of the basic safety requirements with entering a confined space, such as a tank, is to evaluate if the tank is a Permit-Required Confined Space, PRCS. The employer’s overall program for controlling, and where appropriate, for protecting employees from, permit space hazards and for regulating employee entry into permit spaces. Have equipment available for safe entry into a permit space includes: testing, monitoring, ventilating, communications, lighting equipment, and retrieval devices. Must be signed by the entry supervisor. Must be posted at all entrances or otherwise made available to entrants before they enter a permit space. The permit must verify that pre-entry preparations outlined in the standard have been completed. The duration of entry permits must not exceed the time required to complete an assignment. Must provide proper training for all workers who are required to work in permit spaces. Must ensure that the employees have acquired the understanding, knowledge and skills necessary to safely perform their duties. Required to know space hazards, including information on the means of exposure such as inhalation or dermal absorption, signs of symptoms and consequences of the exposure. Must wear a chest or full body harness with a retrieval line, and other required equipment. Required to remain outside the permit space during entry operations unless relieved by another authorized attendant. Perform non-entry rescues when specified by the facility’s rescue procedure. Required to know space hazards including information on the mode of exposure, signs or symptoms and consequences. Must cancel entry permits when an assignment is completed or when new conditions exist. Must provide rescue service personnel with personal protective and rescue equipment, including respirators, and training in how to use it. Employees must immediately leave the space, and evaluate the space to determine the cause of the hazardous atmosphere and modify the program as necessary. Must inform contractors whom they hire to enter permit spaces about the hazards. Must ensure the contractors have a permit space entry program or the contractor must use the facility’s permit space program. 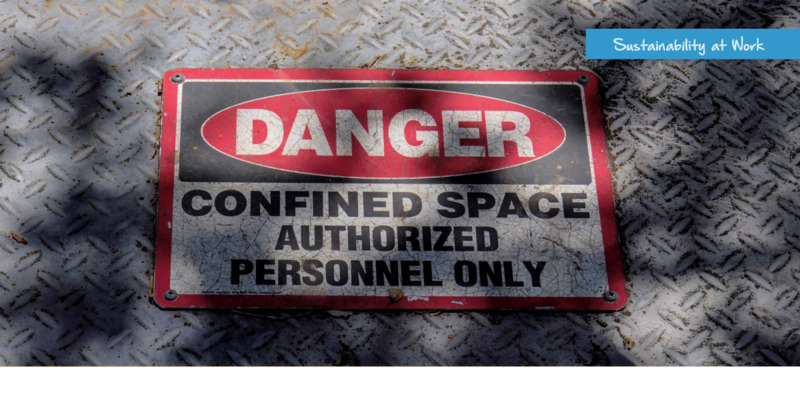 A permit-required confined space may be reclassified as non-permit confined space if the space poses no actual or potential hazards and if all the hazards within the space are eliminated without entry into the space. If the facility can demonstrate with monitoring and inspection data that the only hazard is an actual or potential hazardous atmosphere that can be made safe for entry using continuous forced air ventilation, then it may be exempted from some permit space requirements, such as permits and attendants. However, the facility will test the internal atmosphere of the space for oxygen content, flammable gases and vapors, and the potential for toxic air contaminants before any employee enters it. The facility will provide continuous ventilation and verify that the required measurements are performed before entry. If the entrance or portal is too small for a worker to completely enter a tank, or if the tank itself is too small for a worker to completely enter, then the space is not a confined space, thus a permit-required confined space entry program does not apply. Tradebe blog article "Tank Inspections 101"